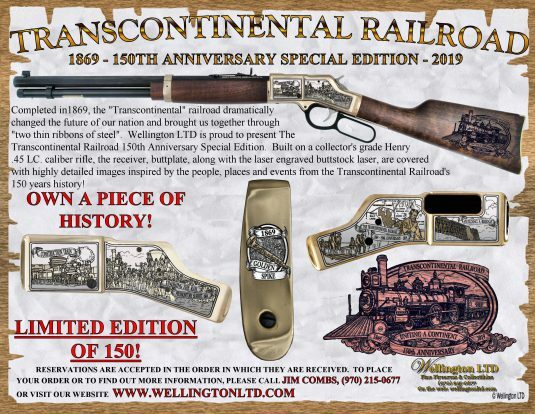 The Transcontinental Railroad 150th Anniversary Special Edition - Wellington LTD.
How about a fundraiser?This collectable rifle can be a great fundraiser for a variety of associations or clubs! This edition is strictly limited to 150! Each is individually numbered and comes with a Certificate of Authenticity. Reservations are accepted in the order in which they are received. For more information, please e-mail us or call (970) 215-0677. The Confederate States of America 150th Anniversary Virginia Special Edition is a Collector’s Grade Henry .45LC rifle with blued barrel. The brass receiver is richly engraved and highlighted in jewelry-grade nickel while the rich American Walnut is laser engraved. All with detailed images inspired by people and events from our nation’s Civil War history!ONLY 50 PER STATE!